The poignancy of Christmas 2014, marking the centenary of that famous truce in the First World War, a conflict in which soldiers on both sides believed that they’d be “home by Christmas” has a compelling resonance. Whilst a leading supermarket chain has already themed its seasonal TV ad campaign around the event, it was some 18 months ago in Stratford that the RSC engaged Phil Porter to write a truthful, even if not entirely accurate story, intended to reflect both the tragedy and the humanity of the “war to end all wars” that defined the Christmas truce. There is much beauty in Porter’s writing. The Christmas Truce opens to a typically English summer mise en scene, before the war’s outbreak. A village cricket match, complete with Vicar’s tea-time speech is played (the first of many sporting allegories that run through the play) before the action seamlessly segues into the mists and murk of the conflict in northern France. Porter’s research is impressive and reflecting the local roots of the RSC his tale focuses upon a platoon of troops from the Royal Warwickshire Regiment and the battles, along with the truce, that they waged with their Saxon enemy. Much of the show’s stagecraft is beautifully simple. The Royal Shakespeare Theatre is a world class auditorium and whilst the simplicity of denuded trees and upturned benches and barricades successfully evokes the trenches, the technology that enables mists to rise from the floor, or a fog to roll down from the backstage are moving enhancements to the production’s physical charm. As a family show the gruesome details of conflict have had to have been airbrushed out. It is therefore a tribute not only to Porter's writing, but also to designer Tom Piper, creator of the recently acclaimed commemorative poppies display at the Tower of London, Blood Swept Lands and Seas of Red, that both the gallows-humour camaraderie, along with the horrors of war “in theatre,” are so effectively played out, in theatre. There are plenty of crashes and bangs to depict the battles that the men fight, but there is also much focus upon the work of the Queen Alexandra’s nursing service (the QAs), founded in 1902 upon principles established by Florence Nightingale. The role of the QAs in the show provide a platform on which to tell of the lesser known contribution made by women during this terrible conflict, whilst the actual historic details of the Christmas truce reveal that not only were of course the eponymous football match(es) played (complete with a gag about Germans and penalties), but also, movingly, that much of the Christmas Day was spent by troops of both sides recovering the bodies of their fallen from no mans land for dignified burial. In a solid cast throughout, Gerald Horan’s Old Bill, a leathery tommy who has seen it all brings a credible gravitas to the inter-national meeting between the trenches, whilst Leah Whitaker’s Matron conveys caring dignity and discipline that at last lays to rest the clichéd Matron that (our beloved) Hattie Jacques imprinted upon a nation. 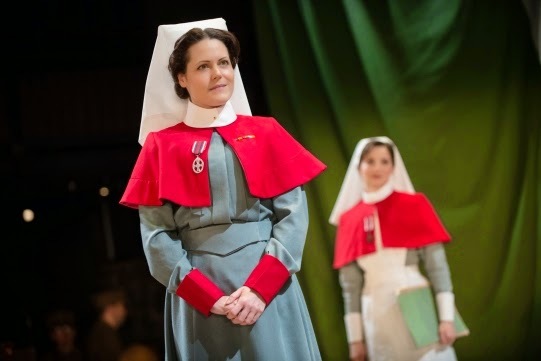 If there is but one flaw in Porter’s story it is the likening of a (fictional) truce between committed nurse Phoebe (elegantly played by Frances McNamee), a firebrand of female emancipation and the hardened Matron with whom she crosses swords and the actual truce that occurred at the Front. The two do not compare. 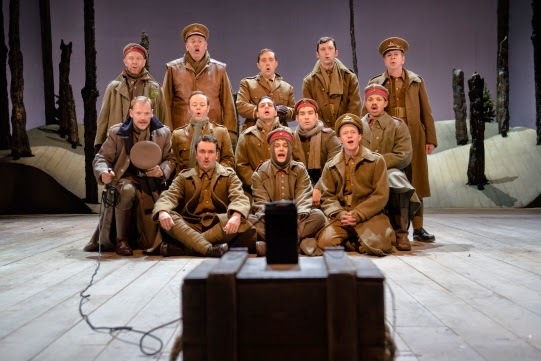 With an authentic musical accompaniment from an on-stage octet, Erica Whyman directs assuredly and it is a credit to both her and the entire company that in particular, the bleakness of no mans land is so effectively portrayed mainly via the performance skills of her actors. There is much to be learned from this seasonal offering. Aside from the history, the play’s closing scene contrasts the blessed sanctity of the Christmas spirit (irrespective of one’s individual faith) with the infernal inhumanity of conflict. The Christmas Truce is woven around an underlying sense of decency and compassion of man towards his fellow man. If only that same spirit prevailed in so much of the global strife we witness around us today.